The Senate, on Wednesday, approved the payment of N338.925 billion as refund to two states, six contractors and 269 companies for projects executed for federal government as well as claims from Export Expansion Grant (EEG) scheme. The approved payment, which will be in promissory note programme and bond issuance, was sequel to the presentation of a 14-page report of Senate Ad-hoc committee ‘on promissory note programme and a bond issuance to settle inherited local debts and contractual obligations on refund to states government; claims in export expansion grant, EEG, scheme and contractors liabilities’ by its Chairman, Senator Francis Alimikehena. The seven-man ad-hoc committee, set up by the Senate at its sitting on May 9, in its report recommended that the total sum of N338.925 billion be refunded to Delta and Taraba States, five construction firms and outstanding claims of 269 verified companies in export expansion grant scheme. The Deputy Senate President, Senator Ike Ikweremadu, who presided over plenary gave the breakdown of the approved refunds to include N67.982 billion and N34.315 billion as refund to Delta and Taraba States respectively for projects executed on behalf of the federal government. 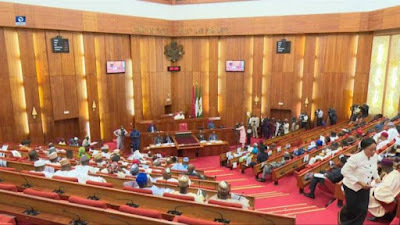 The Senate also approved issuance of N43.586billion promissory note as contractor liabilities to five construction firms vis Setraco Nigeria Limited (N37.43bn); Bouygues Nigeria Limited (N4.636bn); Simidias and I International Company Limited (N346.191m); Hamdala Homes and Agency Limited (N210.6m); and Lejmej Nigeria Limited (N960m). N193.042 billion bond issuance was also approved by the upper legislative chamber to clear the outstanding claims of 269 verified companies under the EEG scheme. The benefitting companies and their amount include B&B Leather (N1.1bn); Chi Limited (N1.3bn); Cadbury Nigeria Plc (N1.5bn); AIS Trades and Industries Limited (N1.8bn); United Fisheries Limited (N100,000); Vista International Limited (N2,000); Sonnex Packaging Limited (N92,000) and MINL Limited (N5.03bn). The Senate also passed six bills for the establishment of six federal tertiary institutions across the country. The institutions which bills were read for the third time before being passed include four polytechnics, one college of education and one university of technology. The polytechnics are to be located in Mpu, Enugu State; Kwale in Delta State, Kaltungo in Gombe State and Adikpo in Benue State. The university known as City University of Technology is to be situated at Auchi in Edo while the College of Education is to be sited in Omuo-Ekiti in Ekiti State. The bills were passed following the consideration of the reports of the Committee on Tertiary Institutions and TETFUND, presented by its Chairman, Senator Jibrin Barau. While making the presentation, Barau said the country was short of the number of tertiary institutions it needed to meet its educational goals and aspirations. He said, “In fact we have not attained 20 per cent of our requirements, so these institutions need to be established. After presentation of the reports, the Senators dissolved into a Committee of the whole and considered the bills clause by clause before they were read for the third time and passed. Ekweremadu, who presided over the plenary session, expressed optimism that the institutions, when established would expand educational opportunities for the country’s youth, who were eager to receive higher education. “I pray that the government takes steps to ensure these schools are established as soon as possible, and the necessary infrastructure provided for their early takeoff,” he said.